Jeff For Banks: Does fee income hedge banks and credit unions from spread swings? Does fee income hedge banks and credit unions from spread swings? The drum is starting to beat again for fee income in the minds of banking executives and in financial institution strategy sessions. This week I heard "hedge" against interest rate fluctuations, a comment more common in the late 1990's to mid 2000's. So I ran some numbers, and the answer to the post title is: it depends. Fee income comes in many sources. And for most community banks, which I define as banks with less than $10 billion in assets, fee income comprises 10%-20% of total revenue, on average. 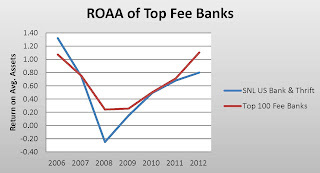 See the table for a break down of fee income sources by Call Report category for community banks. With all the talk about fee income lines of business, much if not most of our fee income comes as additional revenue from traditional spread products, such as deposits or residential mortgages. This makes sense. It is our primary business, and fees improve the profitability of bread and butter banking. But what about this hedge philosophy? I was skeptical. I know from my company's profitability measurement service that fee income products contributed 1% to profits at the average, and -0.8% at the median of all clients. Admittedly, this includes loss leader products such as safe deposit boxes. But, in the main, fee based products are not dropping much to the bottom line. However, when I sorted top fee based banks and compared their Return on Average Assets to the industry, it appears as though having significant amounts of fee income does protect the institution from the ski slope decline in financial performance that plagued the industry. 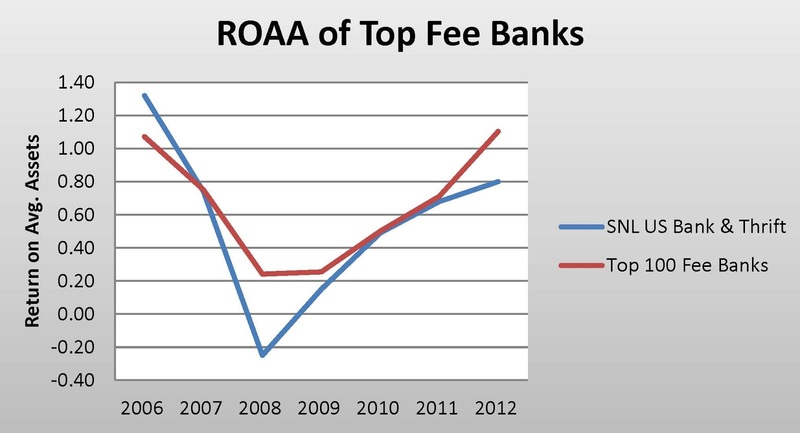 In effect, high levels of fee income gave financial institutions a softer landing at the bottom (see chart). But if financial institutions want more from fee based lines of business than to soften their fall, they must focus on delivering profits. This has been a challenge. When I hear executives clamor over fee income, they more often than not focus on revenue generation, not profits. In my experience, profits have been elusive. I hear lots of excuses why fee-based LOBs don't make money: soft insurance market, best efforts execution on mortgages, stock market decline, high pay to keep talent, yadda, yadda, yadda. I once heard a complaint from a head of Trust about having to share the copier expense with another department that used said copier more. Bottom Line: Insurance, Trust, Investment Advisory, Mortgage Banking, these are all businesses that are common sense complements to traditional spread banking. Almost all of bank customers demand these services. Why can't we deliver them profitably? Good insights on your post. Fee income is indeed tricky. Banks and credit unions must sell the value of those fees to consumers. In fact, it's not about fees: it's about value. That may be why financial institutions struggle with fees and profitability. We certainly can't live off spreads anymore. But living off fees is equally challenging. Jeff - good post. There is no doubt that Community Banks and Credit Unions may be able to increase fee income by offering products & services including Insurance, Trust, Advisory, Wealth Management, etc.. But, simply slapping more products & services on their existing 'menu' is likely to result in little or no improvement. To achieve success, Banks and Credit Unions must develop a business strategy inclusive of specific customer / member segments, product offerings, channels, sales / cross-sell strategies, and pricing. This, combined with a focused marketing and relationship management effort is perhaps the only way for FIs to stand out, to differentiate against their traditional and ever-growing cohort of non-traditional competitors. Developing the product lineup based on customers/ members... what a concept! But the challenge is we often take on these businesses by purchasing them at a premium, and then compensating principles of the business to such an extent that they deliver no profits. So we end up paying for the business... twice! The key may be to grow these businesses organically, beginning with the seed of an experienced person, and planting the garden from there so we are executing our strategy, instead of a purchased firm's principal's exit strategy.